The main advantage of this IR receiver, besides the preamplifier, is that it ignores IR light unless it is modulated (pulsed) at a specific frequency. The last two digits of the part number indicate this carrier frequency in kilohertz and so the TSOP38238 works with a 38 kHz carrier frequency. My original circuit used a transistor connected to a data pin of an Arduino, with this data pin configured as the transmit pin of a serial port. As the serial data was transmitted from this pin, the transistor turned on and off an IR LED to match the serial data output. Below is a schematic that shows on the left the IR transmitter circuit and on the right the IR receiver circuit. In Transmitter Circuit – Arduino2, the transistor Q1 is connected to the transmit pin of a serial port and switches the IR LEDs on and off. I have added a second transistor, Q2, and this transistor is switched on and off at a constant frequency of 38 kHz. Because Q2 is in series with Q1, the serial data from Q1 is modulated by Q2 at 38 kHz. 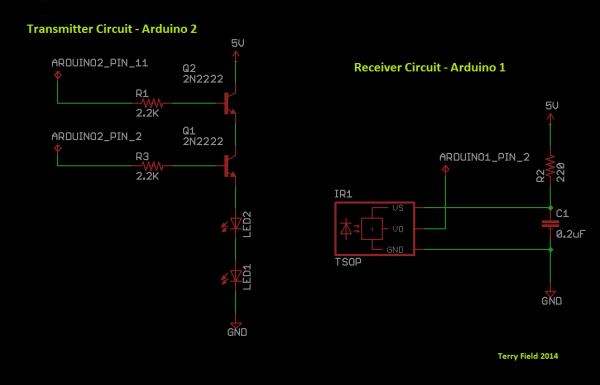 Now the serial data is transmitted on a 38 kHz carrier and can be detected by the IR receiver circuit, Receiver Circuit – Arduino 1, on the right-hand side of the schematic below. The IR receiver circuit is taken from the TSOP382 data sheet. The components R1 and C1 are recommended to prevent electrical overstress. The code in the setup() function above is using a Pulse Width Modulation (PWM) technique to output a 38 kHz square wave on pin 11. Make sure you set the Serial Monitor’s baud rate to 9600. In my next post I will describe a simple protocol to increase the robustness of the data transfer from the transmitter to the receiver. 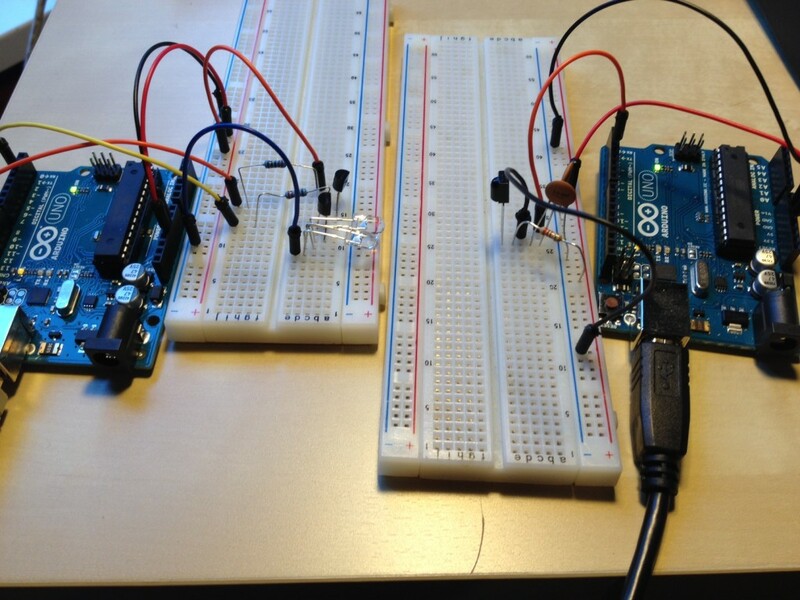 This entry was posted in Arduino and Physical Computing and tagged Arduino, communications, infrared, IR on June 22, 2014 by TerryJField.